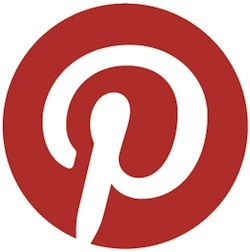 Today’s Find It Friday is about pinterest (we’re having a pinterest week here – did you notice? ;) ). Following a consultation with a new client recently, I thought I’d share some of the questions she had about her new pinterest account and some of the answers I gave her. Her products are bathroom & kitchen sinks and taps. What boards should I set up? Should I just call them Kitchen Sinks, Bathroom Taps? Yes, you can certainly include those boards for the specific product seeker. However, remember to include quirky or different kitchen sinks along with your own pins to those boards too. Don’t concentrate on self-promoting. I’d also suggest setting up boards for the various Kitchen types or styles. For example, contemporary kitchens, classic kitchens, country kitchens, white kitchens, small kitchens etc. If you are selling a product for kitchens, be on the lookout for striking or pretty kitchen images and share them with your followers which will demonstrate your passion and enthusiasm for your product. You can then include some of your own images as well. I see you have a ‘Gardens’ board but you don’t have any products for gardens. Why do you have a board for it? Partly because I like gardening and to me, pinterest is about showing the ‘whole you’ and showing your interests too. It’s not just about the product, it is about showing the lifestyle too. If your target audience were those who wanted ‘country kitchens’, then including boards of cute farmyard animals and country scenes wouldn’t go amiss. I actually did slip one product picture into that board the other day as it was photographed in a pretty garden but generally, that board is just for fun and for sharing. Hubspot recently flagged Oreck, a vacuum cleaning brand, as a great example of how to use images other than the actual vacuum cleaners, to entice pinners to follow and people to engage and buy. While it also has product boards, it also had a board called ‘furry friends’ emphasising subtly of course, that their products can deal with all the dog hairs that pets leave on your sofa. It’s ‘Stunning floors’ board connotes that your floors can be just as stunning by using their products and of course, all the floors are stunning. How will people come to my website from my pins? All the photos pinned from your website or blog are traceable back to their originial source so no matter how many times they are repinned, if someone clicks on them, they will be brought to where you pinned it from. It is a good idea to have a ‘pin it’ button on your blog or on your product pages so that it is easier for visitors to your site to pin the photos (and it reminds them to do so too). How do I merge my products with those of other pinners? Will they stand out like a sore thumb? The cut-out photos of the taps, for example, will look like product shots so yes, it will be evident that they are your products. My tip is to pin them little and often, that is, don’t pin ten photos of taps from your website in one go. Write a clear description for the taps including a benefit for the user or why that tap is perfect for a country kitchen especially if you are pinning it to the ‘Country Kitchens’ board. Little and often. If you are pinning lots, then ensure that they are of different types of photos and for different boards. There is nothing more off-putting than going to my pinterest account and seeing the page almost full of similar pins from a single pinner. 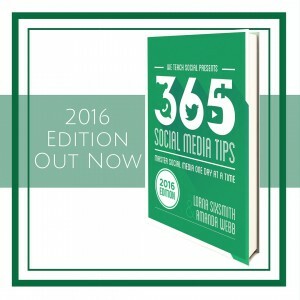 Don’t pin too often to your facebook profile and take care of pinning too often if sending them out as tweets too. Pinerly will soon have a scheduling option which will be a really handy tool. Pinterest allows up to 500 characters but unless you wish to include a tutorial, I think up to 150 characters is sufficient. Ensure that you are including keywords that are likely to be searched for and if you wish, do include a price. At the moment, only the £ and $ signs display across the front of the pin (not the €) but research suggests that pins with prices displayed receive more click throughs. Remember to include a ‘benefit’ for the customer or a tip on how it can be used. I tried to link my Pinterest account to my Facebook business page but it wouldn’t work. Why not? At present, there is only the facility to link pinterest to your personal profile on facebook. It is a case of following other pinners and seeing it they follow you back. By repinning pins you like, this can generate follows too. Don’t rush to follow people – take some time to build up a good portfolio of boards and pins first. Check out our post on why you should set the covers of each board so that they look more attractive. If you have your pinterest account in sync with twitter and facebook, you will be able to see which of your facebook friends are using pinterest and they will be flagged up for you to follow. Find others that have a similar interest to yours. Check out Pinerly which flags up suggested pinners to follow under the various categories (if you need an invite to Pinerly, just ask us for one in the comment box). When you look at a person’s profile on pinterest, you will also see 3 people they have repinned from so it is likely that those pinners follow a similar theme – this can be a handy way of finding new people to follow too. Look at the most popular or the trending pins and boards on Repinly – if they fit in with your style, pin images that are similar to them. How do I build up a relationship with followers? I remember being told that twitter is about relationship building and having conversations. Is pinterest similar? Yes and no, to be honest. About 80% of the pins on Pinterest are repins which suggests that people enjoy looking for fresh content to pin on pinterest rather than on other sites and build their relationships with others by repinning their pins if they like them. 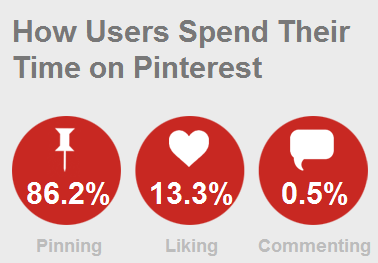 As you can see from the statistics above, we only spend 0.5% of our time on pinterest commenting so we have some way to go in terms of having conversations there. 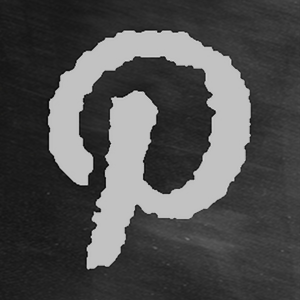 If you have any questions on pinterest, do ask in the comment box. 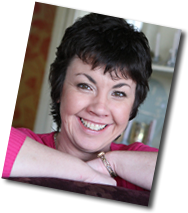 At Write on Track, we offer training on pinterest as well as showing business owners how to blog more effectively for their business so do get in touch if you would like to book a consultation or a training session. Good post. I find many of the organizations I talk with struggle either one: finding the essence of who they are and letting that guide their boards and their pins — not their products, or; two: they lack good visual content and/or an understanding of the value and process for content curation which is essential for a platform like Pinterest. If you can swing an invite to Pinerly I’d appreciate it. I’m on the waiting list, but getting it sooner rather than later would sure be nice! Hi Carla, many thanks for the comment and yes, I agree with you. I just tried to send you an invite but it said that that email belonged to a registered user so perhaps they have just let you in!